I love having an idea; starting with a plan and raw products to create something. When I was a kid, growing up in rural Howard County, my father would bring home a sheet of drywall and leave it in the basement where I had access to it. Once I found out how easy it was to cut with my grandfather’s handsaw, I was creating all summer long. Building boxes, shapes, etc., it didn’t matter, it kept me busy, and drywall was cheap! Six years later, at 14, I started working for my brother-in-law, Mike Greer, framing homes around the Chesapeake Bay area and Howard County. I had the opportunity to work on homes from 1,200 square feet to over 40,000 square feet. It was an amazing experience to be involved with projects of that scale and variety. Needless to say, I was hooked! Thinking of building a log or rustic home and not sure how to begin? Set up a time to meet with Art Holland, owner and principle of A. H. Holland Homes, and learn how the process works, what the timeline would be like and an approximate cost. I first met Art Holland on March 15, 2001. I remember because that was the day my cabin at Deep Creek Lake caught fire and burned to the ground. Once we had made the decision to rebuild, calling Art was my first thought. I had admired his building style, using larger diameter logs and his “Yellowstone Log Homes” business was thriving after having built about 100 homes here in the area. We took several months to decide what we wanted and then approached Art. 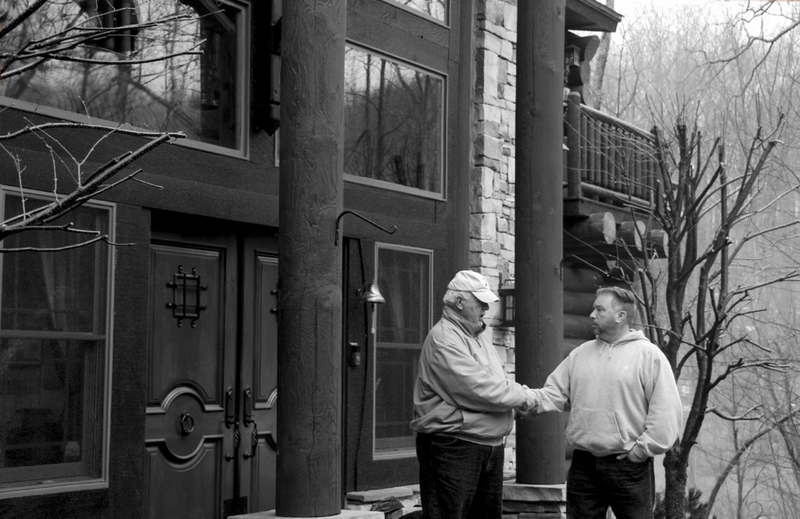 Art’s passion in life is building homes that fulfill his customers’ dreams, and that was apparent to us immediately. I had drawings we had sketched and some ideas about what we wanted, but it was Art who carefully guided us by pointing out alternatives that we hadn’t thought of or different ideas that were cheaper, or easier to accomplish. Some trickier details of the job were artfully built, and the end result was a unique home that we LOVE living in. By all accounts building a custom home is described as one of the most stressful life events a couple can go through. We are pleased and grateful to say that our experience from concept, to planning, construction and finishing to occupancy was the LEAST STRESSFUL project we have accomplished..... entirely due to the expertise and thoughtfulness Art Holland brought to the table. Art listened carefully to our wishes and desires and came up with a house plan that exceeded all of our goals. As an experienced builder with a cadre of top notch craftsmen ,concept became reality. The architectural, mechanical and electrical plans were expertly executed on time and budget. At each stage of construction Art was available and amenable to change. In fact, the architectural and decorating enhancements that transformed this from a house to a home were primarily suggested by Art. He has an eye for and experience with innovative concepts that make a room, bathroom or garage “pop”. Every inspector ,as well as our banker, was impressed and complimentary at each stage of construction. The attention to detail and quality work resulted in a final inspection “punch list” of 5 minor items, all fixed by noon on the last day. Absolutely remarkable for a project of this size. We have lived full-time in our home now for 8 trouble-free years. We highly recommend Art and his company to prospective clients. His honesty, integrity, experience and thoughtfulness will serve you well. We're working on a lakefront project involving zoning, engineering, lake management, history and commitment.. The decision to remove an existing house where family history had been made and cherished is not easy… but when you love the location, but your family has outgrown the structure, it may be time to make a sacrifice. In this case, a 900 square foot cabin has to go, to make room for the new, spacious 3,600 square foot log cabin of your dreams. This new structure will keep in character with the original. It's a log cabin built with recovered, re-purposed logs from the forest surrounding Yellowstone National Park. The design is an A.H.Holland original and incorporates covered porches, a covered deck, Adirondack styling, log stairs, wide-plank distressed pine flooring, slate, stone, a massive fireplace, log crafting from Idaho, and finish log-smithing on site (find out more about this on-site craft). When complete, it will be a rustic Western Lodge-style log home with high efficiency finishes, custom designed and hand-crafted for its owner. A work of Art, built for generations to come!